Claude Greenwood again came close to winning when finishing as runner up at Chelmsford City today, in the apprentice handicap, ridden by Kevin Lundie. From the gate he was driven up to a prominent position then encountered a little interference approaching the first turn. He remained well positioned and led turning into the home straight. In a battle to the line he was just touched off into second place by a neck. To add insult to injury the horse that beat him was Mishrif, the horse Linda leased and took to St. Moritz to finish thirds there. A Little Luck And Lots Of Guts. 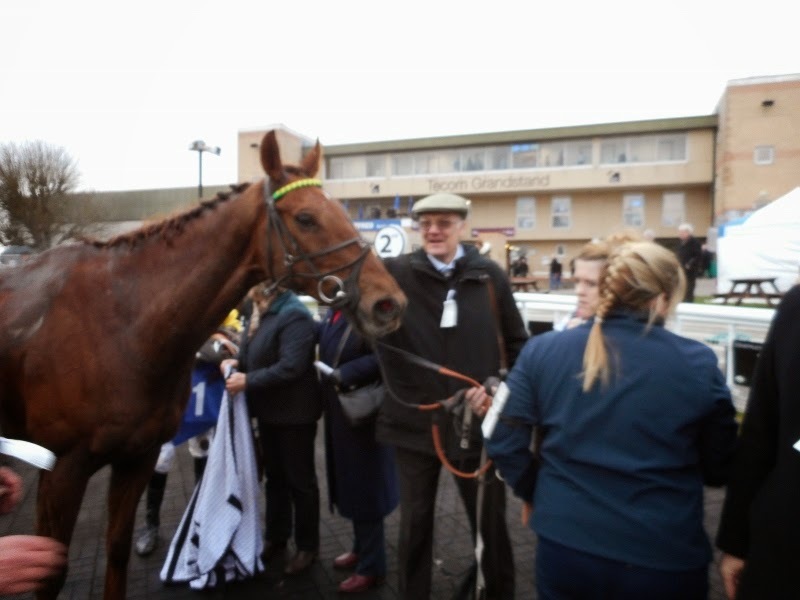 All the qualities that you would wish to see in a racehorse were shown yesterday when Itoldyou won the long distance handicap chase at Fontwell, a race he won last year. This year he was carrying top weight of 11 stone 12 pounds, 10 pounds more than last year. Ridden by Tom Cannon, he set off in 5th place of the seven runners on ground described as good. He remained around this position for the first two circuits until Tom asked him to move closer round the bend going out for the final time. He was hampered in this move but was not put off. He put in some good jumps going down the hill and heading for the bottom bend he moved into third, almost second, behind the favourite. Once again Itoldyou was hampered, this time more badly, and he dropped back to fifth again turning for home. He continued to jump well and began to close again but the favourite was now several lengths clear and going well. Two out the favourite overjumped and knuckled on landing hampering the then second placed horse and Itoldyou, but leaving them and one other to fight out the finish. Another great jump at the last saw Itoldyou take the lead and he battled to the line and victory by a neck and the same. Itoldyou is welcomed back after his win. 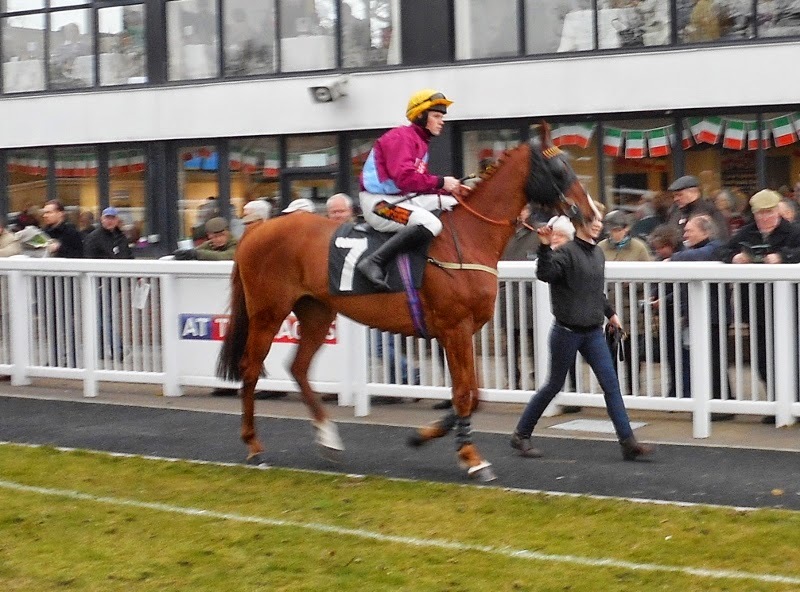 Linda's day continued to go well when Maccabees finished second in the next race, a 3 mile 3 furlong handicap hurdle for his new owners Keith Johnson and Kim Jessop. Ridden by Thomas Cheesman, he was held up at the back as he was attempting this marathon trip for the first time. He moved into a closer position turning for home and ran on up the straight passing horses, but just failed to catch the leader. A delighted Kim and Maccabees. Linda was not able to greet this success as she set off for Gatwick airport to go to Ireland to look at horses while the race was being run! 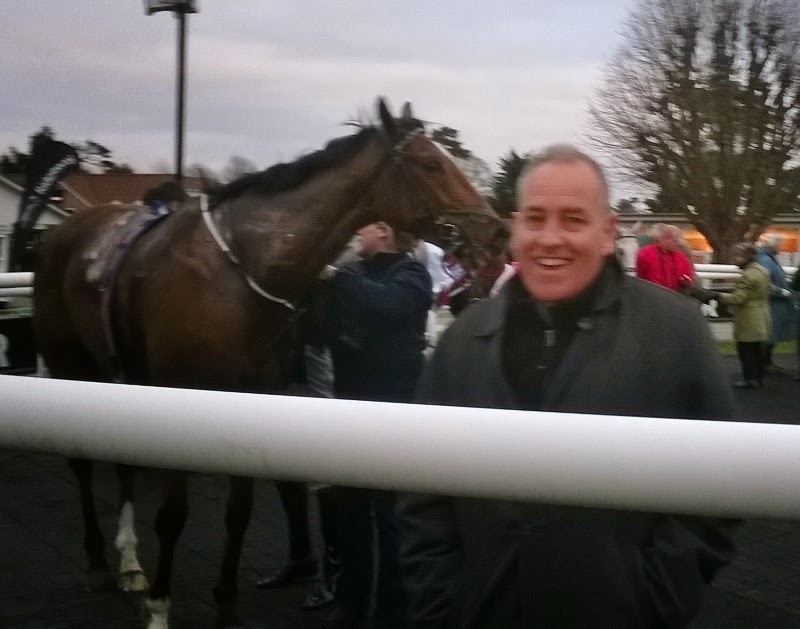 Claude Greenwood ran his usual honest race at Kempton this evening. Ridden by Rab Havlin in the one mile handicap, he broke well and went straight into the lead. He set a good pace and already had several struggling turning into the home straight. He was challenged on both sides one furlong from home but battled on and almost prevailed. He finished second, beaten three quarters of a length, in a race where a length and a half covered the first six finishers. 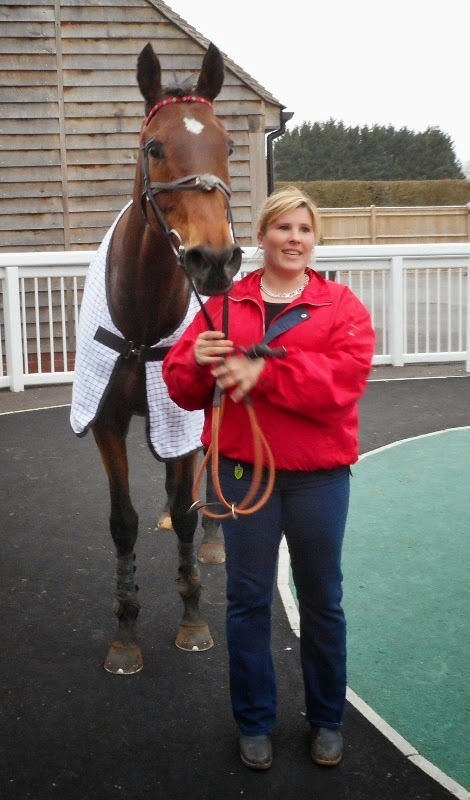 Fleeting Indian finished 3rd under the lights at Chelmsford City tonight. In the 5 furlong handicap, ridden by Rab Havlin, he was outpaced early on and travelled 4th of the five runners. Entering the straight he began to make up ground on the outside and was staying on in the final furlong. He was closest at the finish beaten one and a quarter lengths by the winner. He has been consistent in his grade and a race must surely come his way soon. Saturday's trip to the hunt (see previous post) did the trick as Red Anchor looked happy in himself and ran out the comfortable winner of the three and a quarter mile handicap chase at Plumpton today. He was calm in the parade ring and then set off prominently in the race, under in form claimer Thomas Garner. A calm Red Anchor goes out to race. 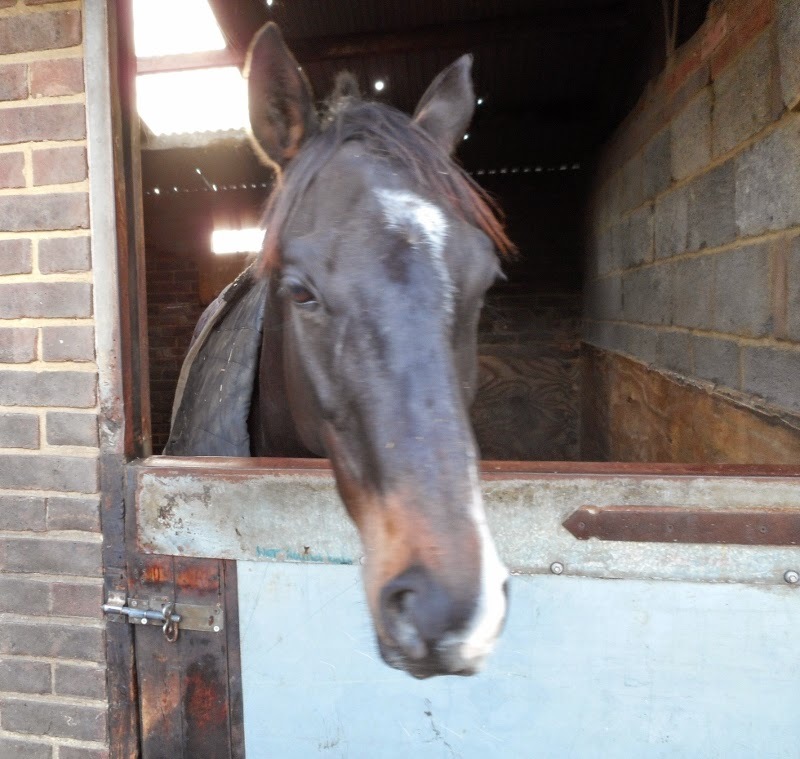 The race favourite made the running and Thomas kept Red Anchor well in touch in second place. He jumped well and going out on the final circuit he was asked for an effort to close the gap. He moved alongside in the back straight and seemed to be going the better when the favourite blundered and unseated his rider at the open ditch. This left Red Anchor well clear and he just needed to be kept going and make sure of his jumps over the last two fences, before being eased approaching the line. Thomas Garner feeds back to Linda after Red Anchor's win. 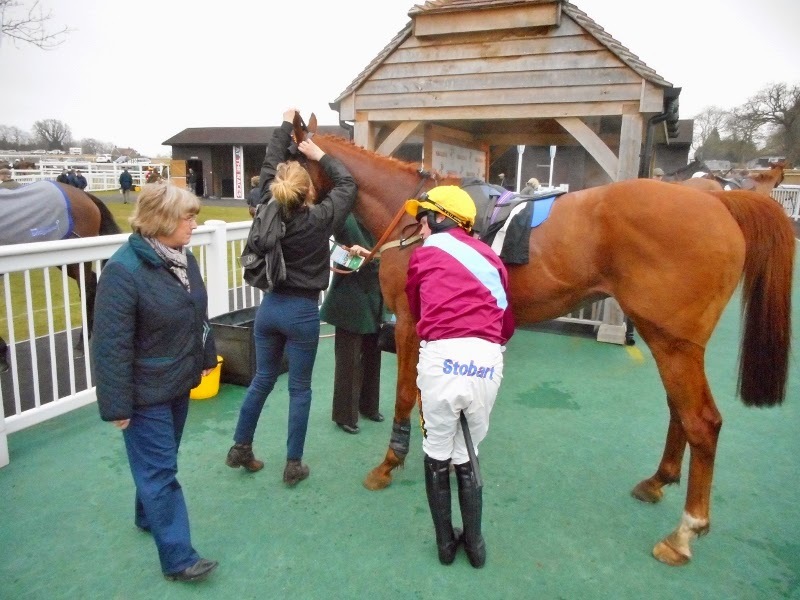 Linda's good day continued when Kayflin also put her recent disappointing run behind her when finishing third in the closing handicap hurdle. 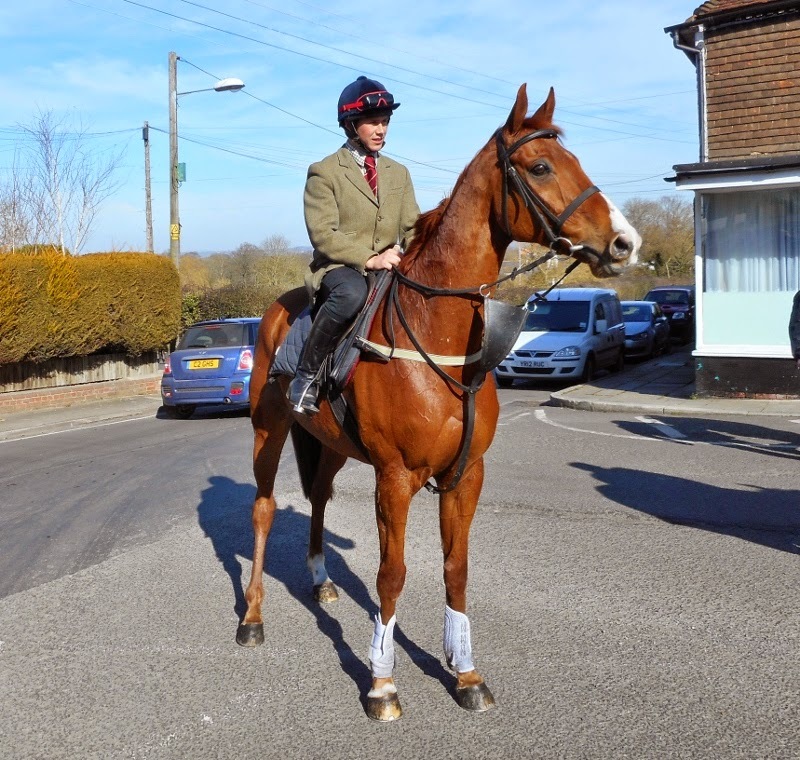 As part of his preparation for a race, at either Plumpton next Monday or Huntingdon next Wednesday, Red Anchor went out today with the local hunt who met at Frittenden. 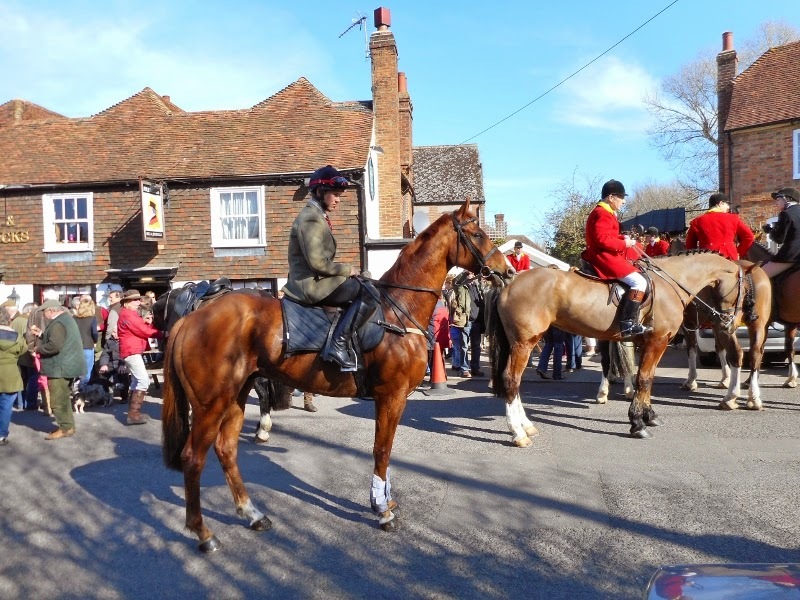 He enjoyed the experience and was fascinated by the hounds, other horses and throngs of supporters. Mike was able to canter him for half a mile or so as well as pop him over some posts and rails. 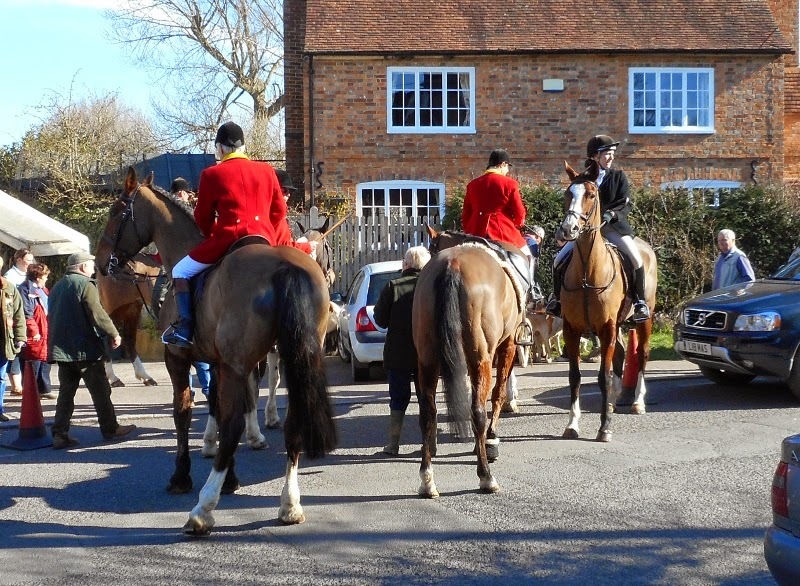 He only spent a short time with the hunt before returning to the stable, hopefully invigorated for next week.